Remove trim panels to protect them from being scratched. See Remove the Trim Panels to remove the following parts. Remove the two side trim panels. Remove the standoffs nearest to the lower fan cage to protect them from breakage. Remove the fan modules from the lower fan cage. Place the fan modules on a grounded mat for safety. The empty cage weighs 39 lb (18 kg). Loosen the captive screws at the four corners of the fan cage. Note - The scalability card cage has been omitted from the illustration for clarity. Do not remove the scalability card cage. Pull the fan cage out approximately 1 in (25 mm) or until it is free of the guide pins at the rear of the slot. Tilt the fan cage and pull it out of the slot. 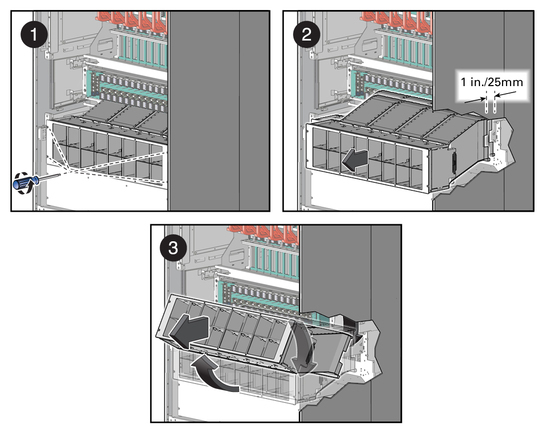 Tilt the fan cage down at an angle of approximately 15 degrees so that the rear of the fan cage can bypass the bottom of the scalability card cage. To install the fan cage, see Install the Lower Fan Cage.